This is the era of Luke Skywalker’s legacy: The Jedi Master has unified the order into a cohesive group of powerful Jedi Knights. 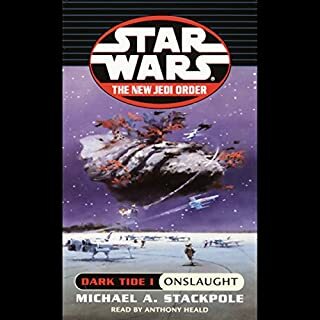 But as the new era begins, planetary interests threaten to disrupt this time of relative peace, and Luke is plagued with visions of an approaching darkness. Evil is rising again - out of the best intentions - and it looks as if the legacy of the Skywalkers may come full circle. 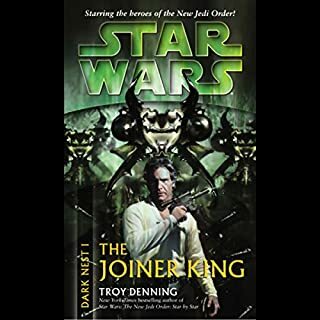 Honor and duty will collide with friendship and blood ties as the Skywalker and Solo clans find themselves on opposing sides of an explosive conflict with potentially devastating repercussions for both families, for the Jedi order, and for the entire galaxy. 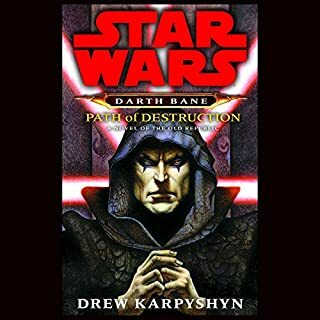 When a mission to uncover an illegal missile factory on the planet Adumar ends in a violent ambush - from which Jedi Knight Jacen Solo and his protégé and cousin, Ben Skywalker, narrowly escape with their lives - it’s the most alarming evidence yet that sparks of political unrest are threatening to ignite into total rebellion. The governments of numerous worlds are chafing under the strict regulations of the Galactic Alliance, and diplomatic efforts to enforce compliance are failing. Fearing the worst, the Alliance readies a preemptive display of military might in a bid to bring the rogue worlds in line before an uprising erupts. The designated target of this exercise: planet Corellia - renowned for the brash independence and renegade spirit that have made its favorite son, Han Solo, a legend. Something of a rogue himself, Jacen is nevertheless duty bound as a Jedi to stand with his uncle, Jedi Master Luke Skywalker, on the side of the Galactic Alliance. But when the wary Corellians launch a counterstrike, the Alliance’s show of force - and a secret mission to disable Corellia’s crucial Centerpoint Station - give way to an armed skirmish. Once the smoke clears, the battle lines are drawn. Now, the specter of full-scale war looms between a growing cadre of defiant planets and the Galactic Alliance that some fear is becoming a new Empire. And even as both sides struggle to find a diplomatic solution, mysterious acts of treachery and sabotage threaten peace efforts at every turn. Determined to root out those behind the mayhem, Jacen follows a trail of cryptic clues to a dark rendezvous with the most shocking of revelations...while Luke grapples with something even more troubling: dream visions of a shadowy figure whose Force power and ruthlessness remind him of Darth Vader - a lethal enemy who strikes like a dark spirit on a mission of doom. An agent of evil who, if Luke’s visions come to pass, will bring untold pain to the Jedi Master...and to the entire galaxy. ©2006 Lucasfilm Ltd. and TM. (P)2006 Lucasfilm Ltd. and TM. Unfortunately this suffered terribly from the abridgement. The story and character development are completely missing leaving the book as a series of events lacking any real context. Fine if it's a b-grade action movie but if you care about character motivation then you most likely won't enjoy this. You often find yourself rolling your eyes at the actions characters are taking as they make no/little logical sense. I imagine that the explanations for their reasoning lies in those parts that have been cut. 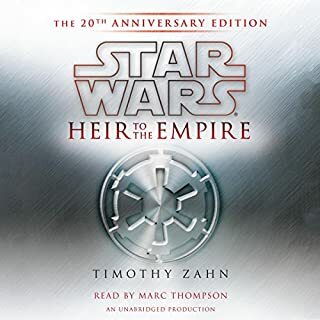 I've really enjoyed the Star Wars universe series on Audible (bar a few exceptions) and would re-listen to an unabridged version if it were available as I suspect it would have all the missing pieces that make a book a book. 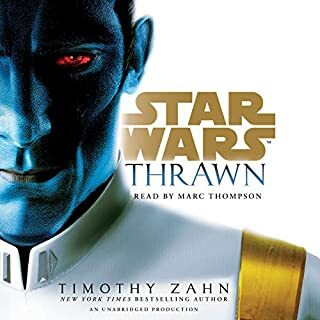 After finishing the thrawn trilogy and hand of thrawn 1-2 this fell flat. 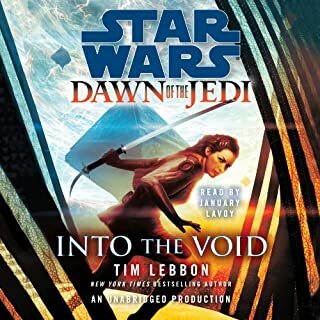 Marc Thompson nailed the unique voices in those 5 books especially han solo, all were great impressions of the characters voices. But here there were hardly any differences at all. i couldn't tell if a female or male character was speaking or who at all as they all sound the same. the story itself jumped from point to point giving the impression parts were missing or cut. i can tell there is a decent story there or at least potential but whether i want to invest in the others in the series im not sure yet. Wow, this is the first time abridging a book has resulted in it being completely incomprehensible. The reading jumps from scene to scene leaving out details that would have explained why the characters are now in this new location. I could barely make it through the first hour of this one before demanding a refund. Please replace this one with an unabridged version. 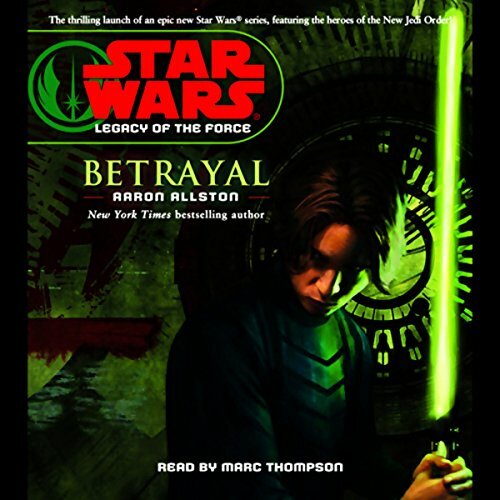 What was most disappointing about Aaron Allston’s story? The reader was good and they added some cool sound effects and of course Star Wars theme music. So no fault of the performers. Would you listen to another book narrated by Marc Thompson? The opposite. Put scenes back until a comprehensible story emerges. Here's an idea: It's not that long a book. How about putting it all back? What disappointed you about Star Wars: Legacy of the Force #1: Betrayal? A lot of hacking, cutting, to many holes, I felt as I was tossed under a bus. Stop hacking and slashing books. This was the first Star Wars book I ever read many years ago. I still remembered many points in the story that I enjoyed, whether they were character development, relationship building/defining between the characters, various events that fleshed out the story, or even insights into the mind of the "villan" and how they created the end result they desired. To my disappointment, most of the things I remembered having an impact on me were removed from this story. If you're looking for (or can be satisfied with) a bare-bones plot version of a spectacular book, this is for you. But, if you want to understand not just how things happened but why, if you want to understand the characters, their motivations, and their emotions behind the things they do and the struggles they have, you'll have to read the book. Was it good? Yes. Marc Thompson was great, although he's usually spot on with Hans Solo and it wasn't quite as precise this time. I need the omitted info to try and make better sense about the storyline. I hope unabridged versions come available one day. A) The abridged versions are terrible. A big part of the SW universe is the description, most of which is cut out in the abridgement. 2) The current and future books are all in nine-or-ten part series. It seems like the authors and publishers are just stringing the readers along... A single story from beginning to end costs well over $100. 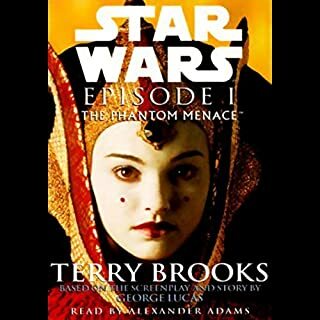 It seems that every Star Wars book is abridged and sound effects added, and this is no exception. I have a well worn copy of this book that I've read at least 10 times, and my son has read as many times. So I thought I'd get the audible to listen to on a motorcycle ride. The sound effects were much louder than the reading and became almost painful when they would BLARE in my helmet unexpectedly. The story was so chopped up that if I hadn't read the book, I wouldn't have known why somethings were happening. I won't be wasting my money on any more abridged Star Wars books. I would rate these as 5 stars if they weren't butchered errrr abridged. Need more story and more Marc Thompson, not less. 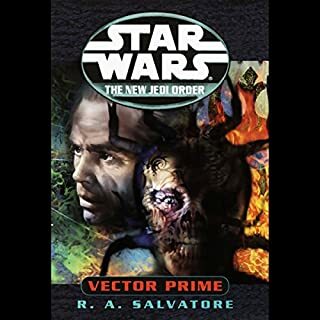 the star wars expanded universe is the most detailed gripping group of stories that takes your most beloved characters from starwars and the authors keep the universe alive in our minds with these great well written series. 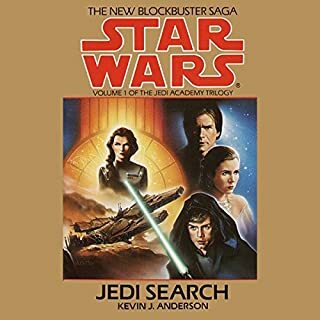 It has to be Jacen solo because of his traumatic experiences in the last series of books he has been through so much and with little support from the jedi order and his fear of what might be could turn him towards the dark side. 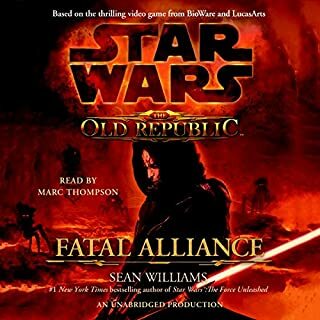 Marc has voiced a lot of the starwars books and is by far the best i have ever heard. Audible is the only place for me, the best quality books by great authors that transport you to another world for just a while and is always there when you need it. This audiobook was well composed and played out well. The sound effects were impressive. The drama was action packed. loved it can't wait to listen to the next one, just got into the story and now it has ended. Not to missed. Great performance and we'll worth the credits. Star Wars rocks big time! 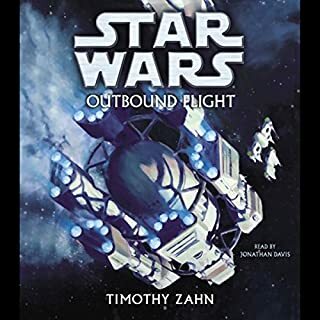 loved it, brilliant short book, looking forward to reading the rest, would recommend to anybody that loves star wars. 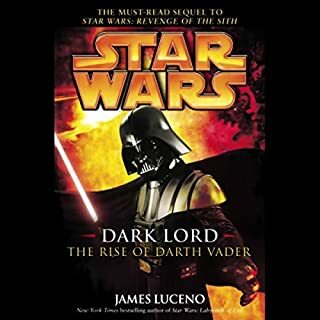 Having read most of this series and now realising my disappointment in the new Skywalker movies, I thought I'd return to them to see if they were as good as I remember... This was pretty good. It was a bit short, but when you consistently resign your self to series of 9 books there's a lot of padding out and the occasional short book. A brilliant presentation of my favourite series in the Star Wars EU. A must listen! The story is just risible. Utter trash. As with most of these Star Wars books they are made more enjoyable by the use of familiar sound effects etc. But there was no saving this one.